As we face the onslaught of climate change, the key to improving food security in developing countries lies in sustainable rice production. Rice-based farming systems can greatly benefit small-scale farmers, especially women, and help end hunger in these countries. According to Maria Helena Semedo, Food and Agriculture Organization (FAO) deputy director-general, rice is critical to global food security. Over three billion people across the globe eat rice every day. Rice is one of the world’s staple cereals, along with wheat and maize. It has been estimated that by 2050, the annual global demand for maize, rice and wheat will reach almost 3.3 billion tonnes. According to the International Rice Research Institute (IRRI), rice production needs to increase by 25 per cent in the next 25 years to meet global demands. In many countries, especially Southeast Asia, rice is a staple crop (around 97 per cent of rice is grown in Asian countries). At the same time rice production is facing the impact of extreme weather events such as droughts and floods. 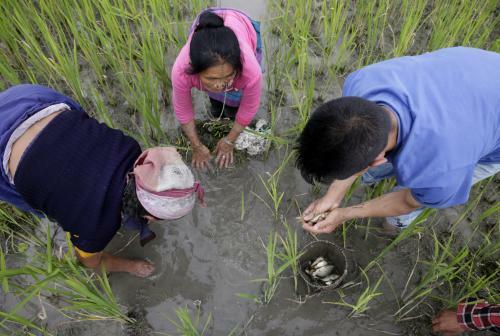 According to the IRRI, about 20 million hectares of rice land is prone to flooding. 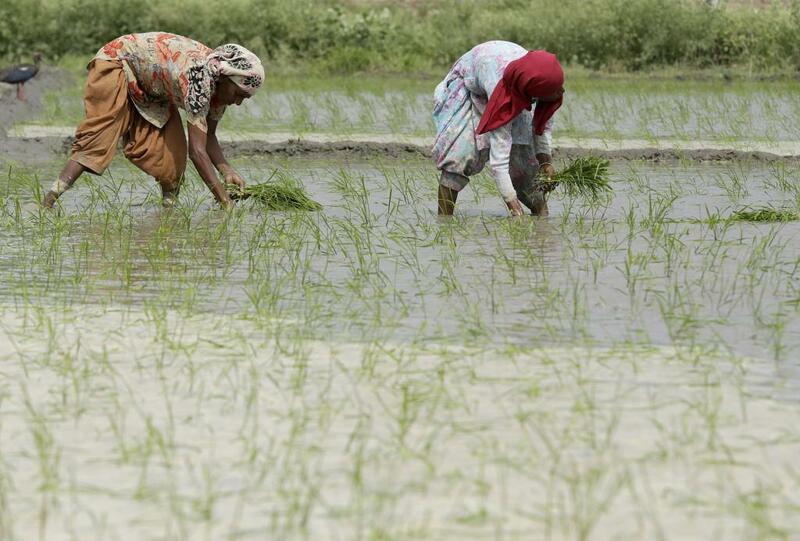 In India and Bangladesh alone, more than 5 million hectares of rice field are flooded during most planting seasons. Take the example of Vietnam for instance. In an interview to Down To Earth, Vietnamese farmer Pham Thi Huan blamed saline soil and mangroves for impacting rice cultivation in her country. To counter this, rice varieties resistant to drought and salinity developed by the Mekong Delta Rice Research Institute were planted. To make rice cultivation sustainable, Huan encouraged women farmers to go in for integrated rice and duck farming to supplement their income. FAO’s “save and grow” method takes into account the sustainability factor when it comes to world’s staple cereals. Under this unique method, farmers are encouraged to produce more with less. The method also advocates natural ecosystem processes. One such example practised in China is the rice-fish farming system wherein farmers rear fish in flooded paddy fields. This has twin advantages. While on one hand, the fish can be sold for extra income or eaten for nutrition, on the other hand, growing fish along with rice helps in controlling fungi and weeds that damage the crop. It thus reduces dependence on pesticides. According to food policy expert Devinder Sharma, integration is good for making more money for farmers. However, rich-fish farming best works for wetland paddy. “Rice-fish is a traditional system that has been largely replaced by intensive rice mono-cropping. We are now seeing, in countries like Indonesia, a revival of aquaculture in rice fields,” FAO’s deputy director of plant production and protection division William Murray told Down To Earth earlier. As rice farmers are among those most vulnerable to climate change, the Sustainable Rice Platform recently established the world’s first standard for sustainable rice. Through this, the IRRI aims to maintain yields for rice farmers and reduce environmental footprint of rice cultivation. Rice cultivation uses a lot of water. But there is no denying that it is linked to livelihoods, Sharma said. While talking about emissions reduction in agriculture, Meryl Richaards, agroecologist at CGIAR (Consultative Group for International Agricultural Research) Research Program on Climate Change, Agriculture and Food Security advocated alternate wetting and drying of paddy. “By reducing the frequency of irrigation (letting the fields drain periodically), methane emissions from flooded rice production can be cut in half,” she said. Though the practice was originally developed to save water, it has potential to be adaptive to climate change as well. "We have to produce more rice using less water"